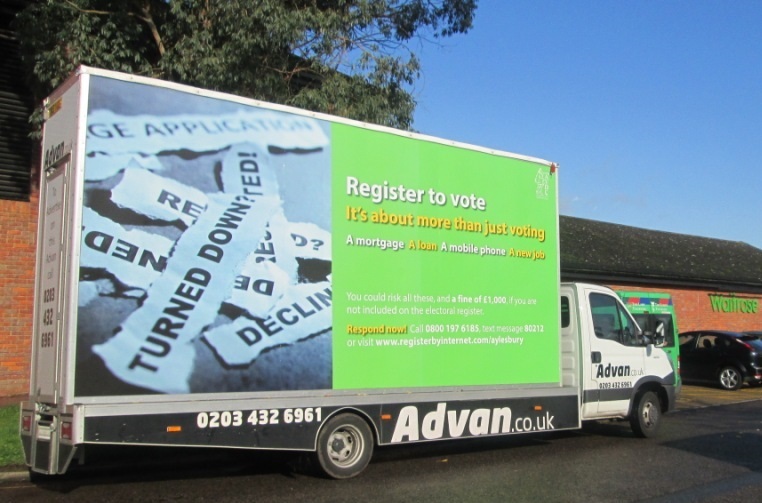 Aylesbury Vale District Council have launched an Advan marketing campaign with Advan.co.uk, encouraging residents to ensure they are on the electoral register. A promotional Advan targeted the Aylesbury region, informing onlookers that registering to vote is “about more than just voting”, as it can risk the chances of securing a mortgage, loan, phone contract or even a new job. Call to action is prompted with the phrase “respond now!”, followed by phone, text and online contact details. Advan advertising allows brands to gain maximum exposure within a controlled time period, with the ability to access entire regions and also target hard-to-reach public spaces. Applicable to all Aylesbury residents, this electoral register message will benefit from the high-frequency coverage that comes with a mobile Advan.